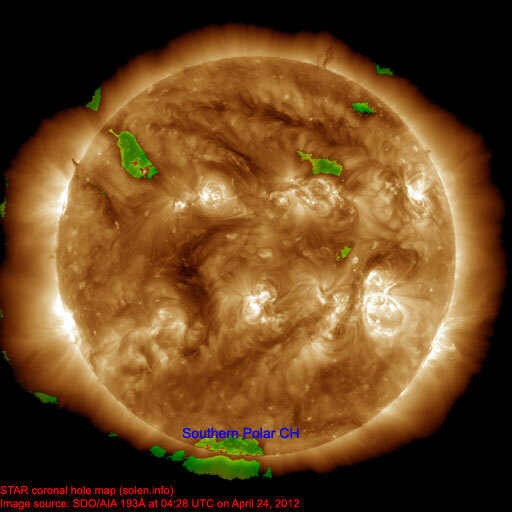 Last major update issued on April 24, 2012 at 04:20 UTC. 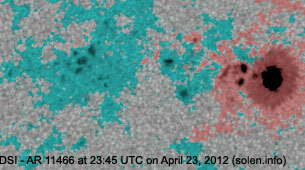 The geomagnetic field was quiet to major storm on April 23. 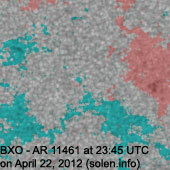 Solar wind speed at SOHO ranged between 324 and 413 km/s. 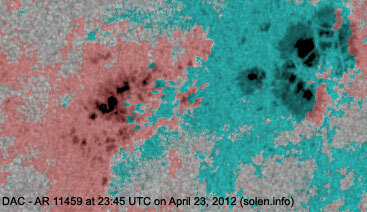 A solar wind shock was observed at SOHO at 02:29 UTC, its source was likely one of the CMEs observed on April 19. 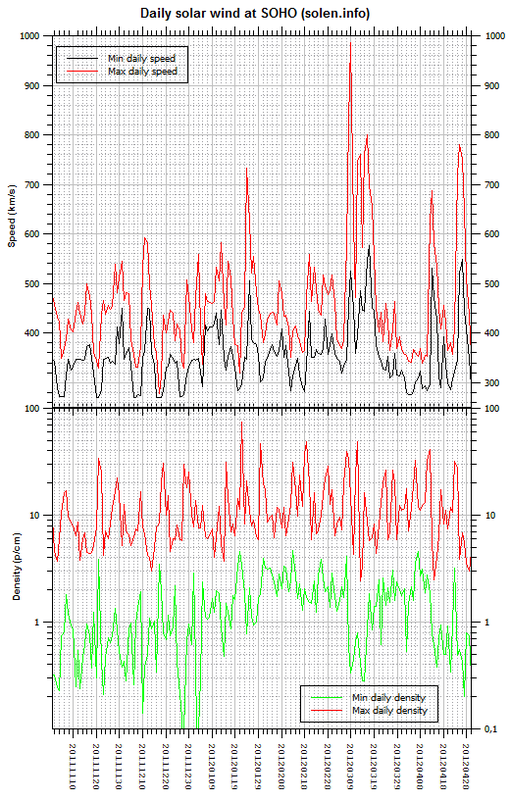 Initially the disturbance appeared to be weak to moderate, however, after 17h UTC the interplanetary magnetic field has been consistently strongly southwards. 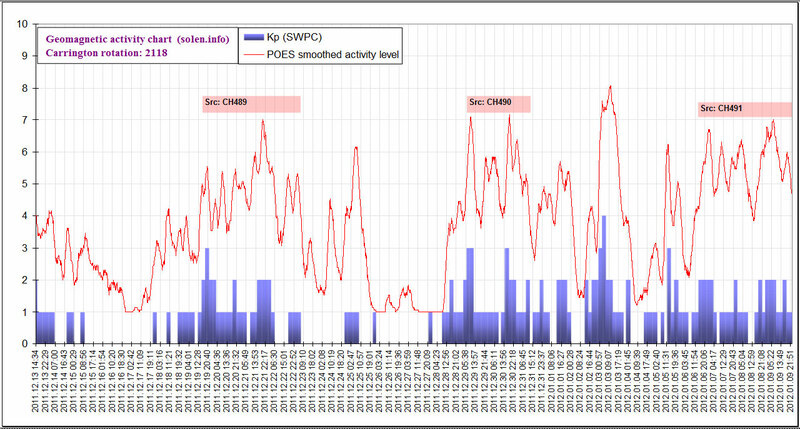 This has caused a strong geomagnetic storm. 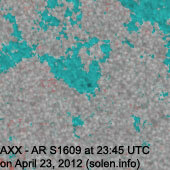 During the 00-03h UTC interval on April 24 the planetary A index reached 156 (Kp 7 - severe storm). 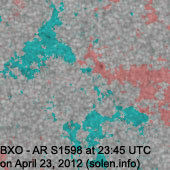 Solar flux measured at 20h UTC on 2.8 GHz was 141.8 (increasing 36.2 over the last solar rotation). 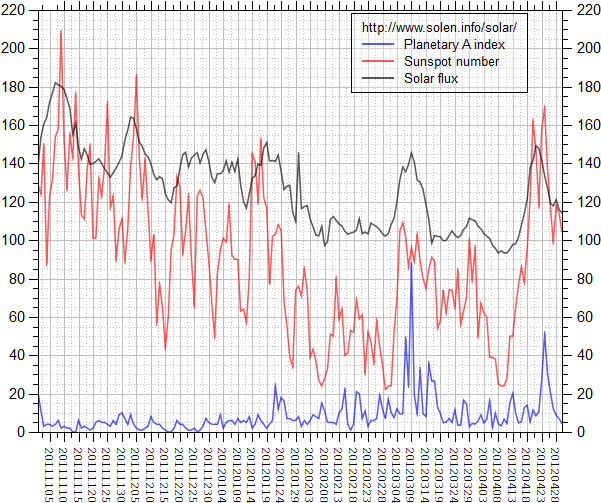 The Potsdam WDC planetary A index was 28 (STAR Ap - based on the mean of three hour interval ap indices: 28.4). 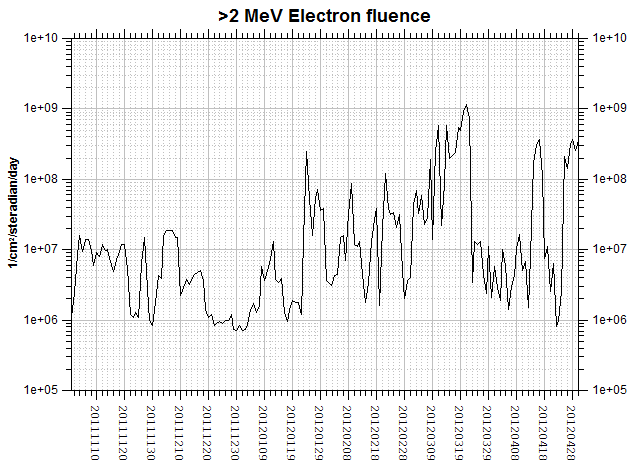 Three hour interval K indices: 24413456 (planetary), 15522544 (Boulder). 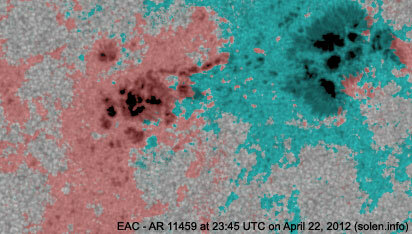 Region 11459 [S16W38] decayed further losing spots and penumbral area. Region 11460 [N15W55] decayed slowly and quietly. 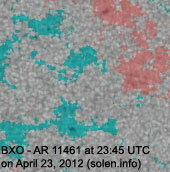 Region 11461 [N11W12] was mostly quiet and stable. 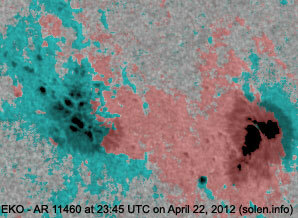 A filament eruption was observed to the south of the region from 12:29 UTC. 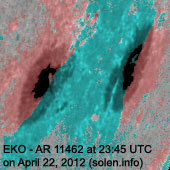 Neither LASCO nor initial investigation of STEREO imagery have revealed any significant CME. 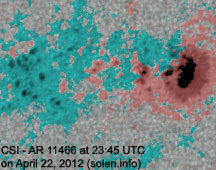 Region 11462 [S25W83] displayed little change and was quiet. 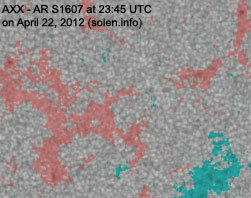 Region 11465 [S18E01] is becoming more complex with nearly all umbrae merging into one large penumbra. 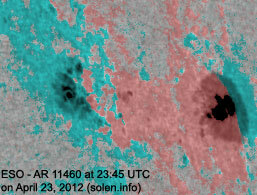 While there is a significant magnetic delta structure in this penumbra, the region has been surprisingly quiet. A major flare is possible. 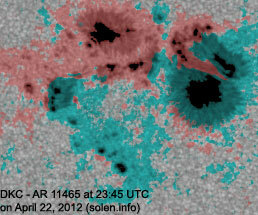 Region 11466 [N12E14] developed slowly and quietly. 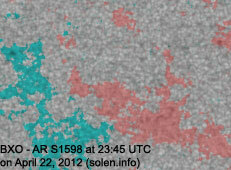 S1598 [N14W20] was quiet and stable. S1604 [N10E26] reemerged with a few spots. 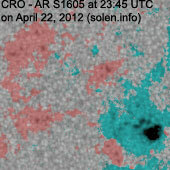 More spots are visible early on April 24. S1605 [S12W37] decayed slowly and quietly. 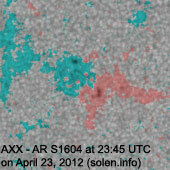 New region S1608 [S18E82] rotated partly into view at the southeast limb on April 23. 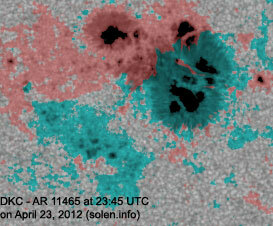 Early on April 24 more spots are visible in a DRI classification. 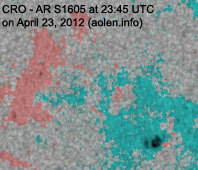 New region S1609 [S27E28] emerged in the southeast quadrant. 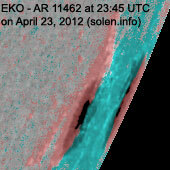 Early on April 24 a new region is rotating into view at the northeast limb. 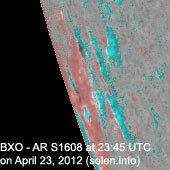 April 21-23: No obviously Earth directed CMEs were observed in LASCO and STEREO imagery. 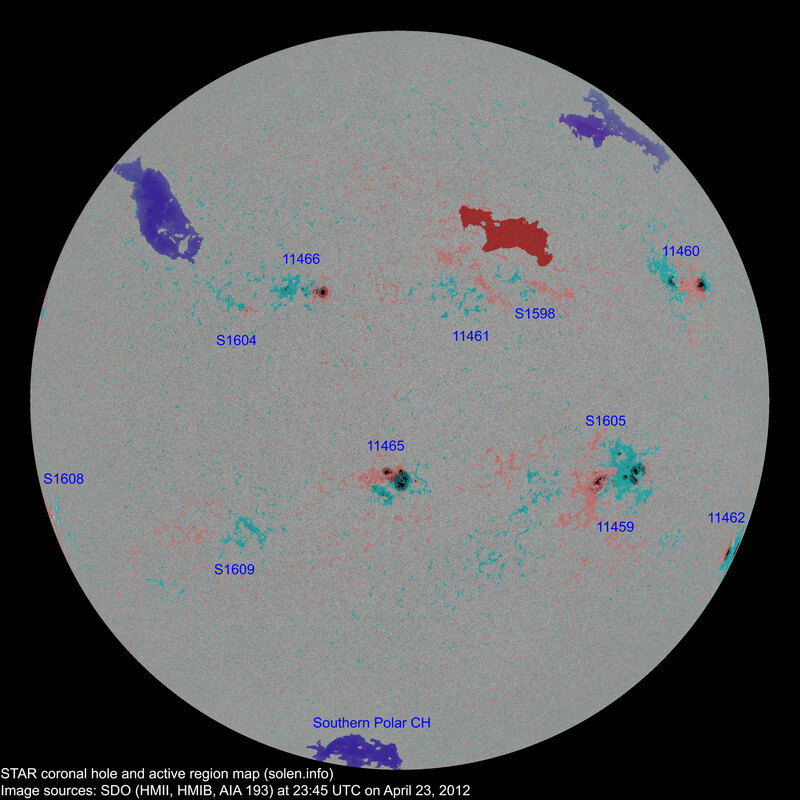 The geomagnetic field is expected to be quiet to severe storm on April 24 due to CME effects and quiet to unsettled on April 25-26.